Are you ready? 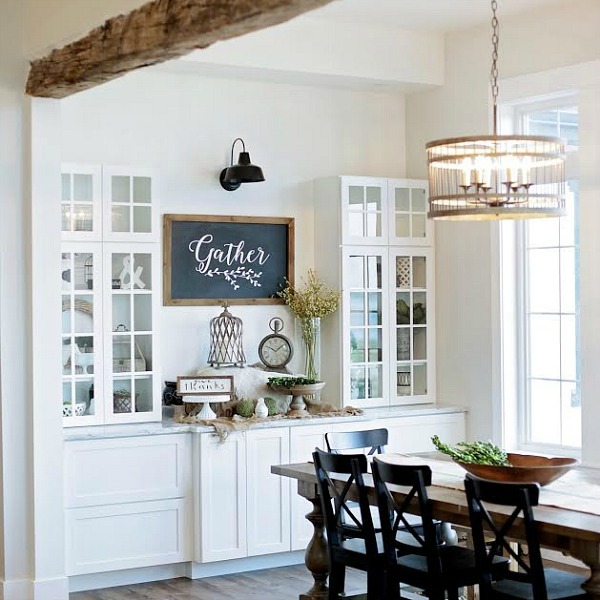 I hope so, because we are going to tour and chat and talk all about the amazing HGTV® Dream Home 2018 and how you can enter for a chance to win it! When I shared my Facebook LIVE tour of the home, I promised to find out everything I could, and I’m so excited to share lots of details about this beautifully located, renovated and decorated 4 bedroom, 3.5 bath home with you. I had the extreme pleasure of getting to tour the house and go behind the scenes, seeing it all. The house feels just like home to me! It’s right here in my beloved Pacific Northwest. 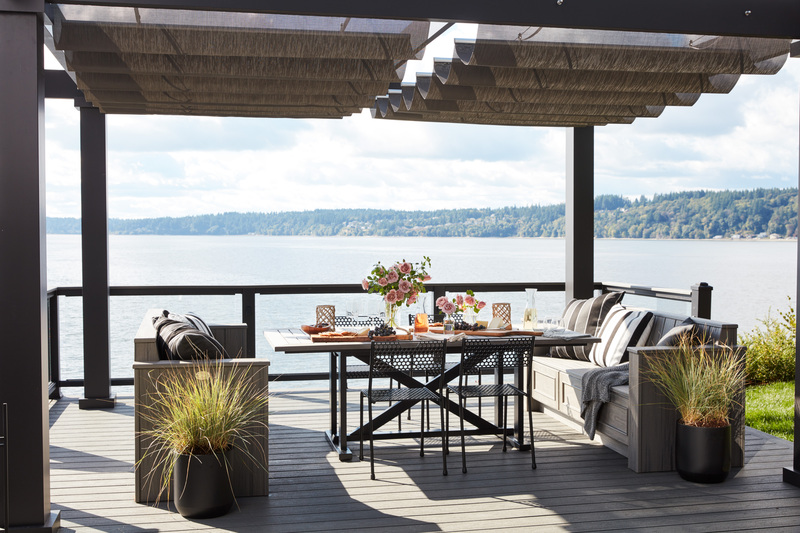 It sits on the shores of Henderson Bay, overlooking Puget Sound, in the charming little town of Gig Harbor in Washington. Jim and I actually drove up together, instead of me flying into Washington, and he drove me all around looking at the homes and neighborhoods, the boat docks, and we even stopped for lunch at a local burger joint called The Gourmet Burger Shop. They were not joking. Delish! We might need to go back, just for the fries! I made sure not to see the home before the big day though. We literally got to see it together in the live video tour. And now I’m sharing it with those of you who didn’t catch that. The town is super enchanting and whoever wins this home is going to be in for a treat! Wait, did I say WIN again? Why yes I did. You can actually enter for a chance to WIN this home, twice a day. All you have to do is click right here to enter for a chance to win, and keep visiting and entering until Friday, February 16th. Set a timer, mark your calendar, whatever it takes. 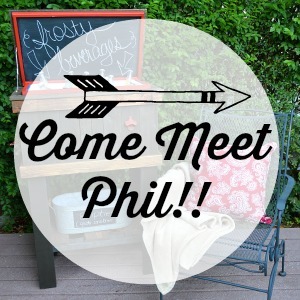 One of my readers needs to win this beauty… and I’d love a personal invite to go back if you do! 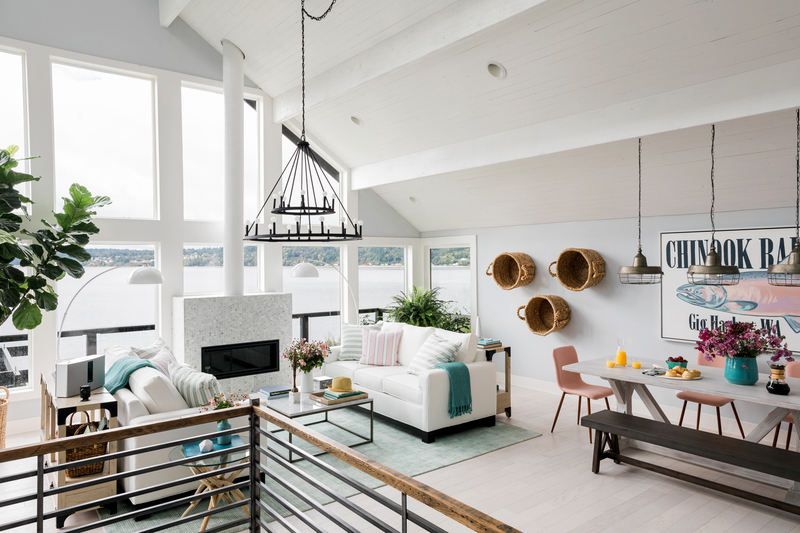 Some details: This year’s giveaway includes the fully-furnished home located in Gig Harbor, Washington overlooking the Puget Sound, plus an all new Honda Accord and $250,000 from national mortgage lender Quicken Loans®. 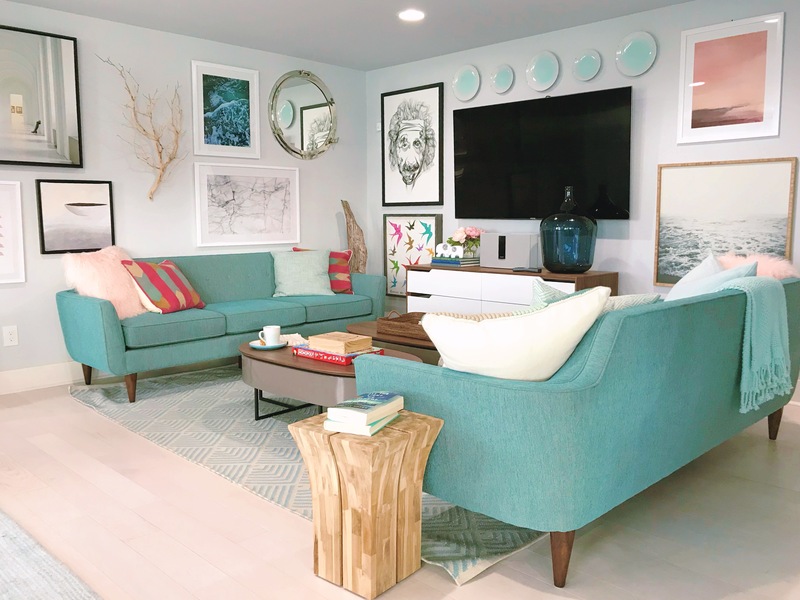 The HGTV Dream Home 2018 Grand Prize Package is valued at over 1.8 million dollars. Not ready to move? Then you can opt for the cash prize instead! I bet you are ready for this tour to start, so let’s go! 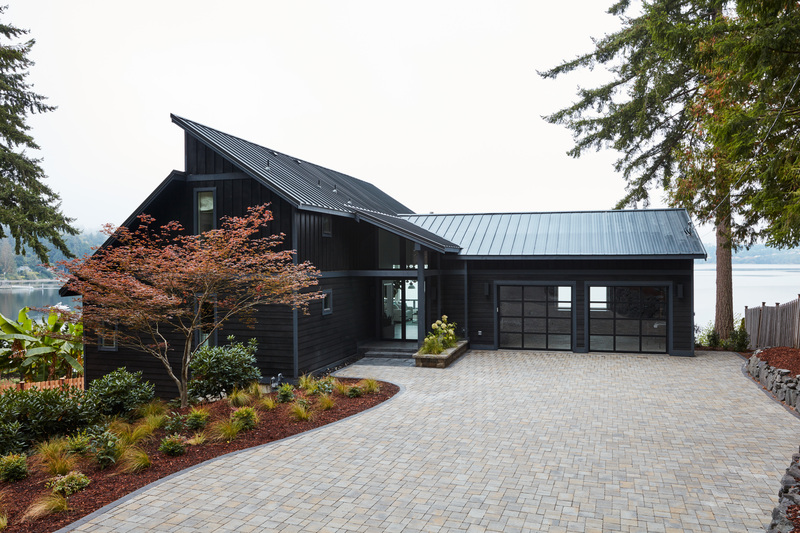 The designer, Brian Patrick Flynn (this is his 3rd year designing the HGTV Dream Home) decided on a dark exterior and it just melts into the setting, letting the scenery be the star. I love the choice and it really makes sense when you take it all in, in person. 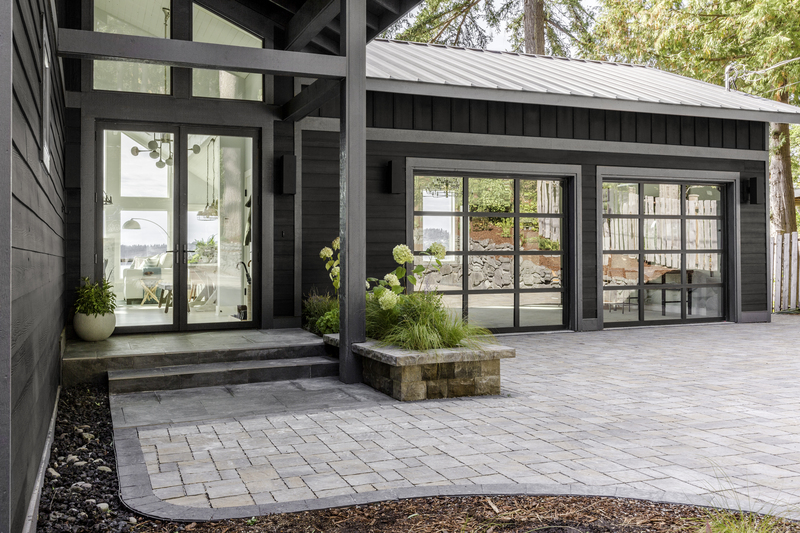 You enter the home through a set of glass doors that let you see straight through the home, allowing you to take in the view before you even set foot inside. The front doors enter into what I think of as the main level. There is a entryway, the garage to the right, a dining area and living room, with the staircase and kitchen to the left. 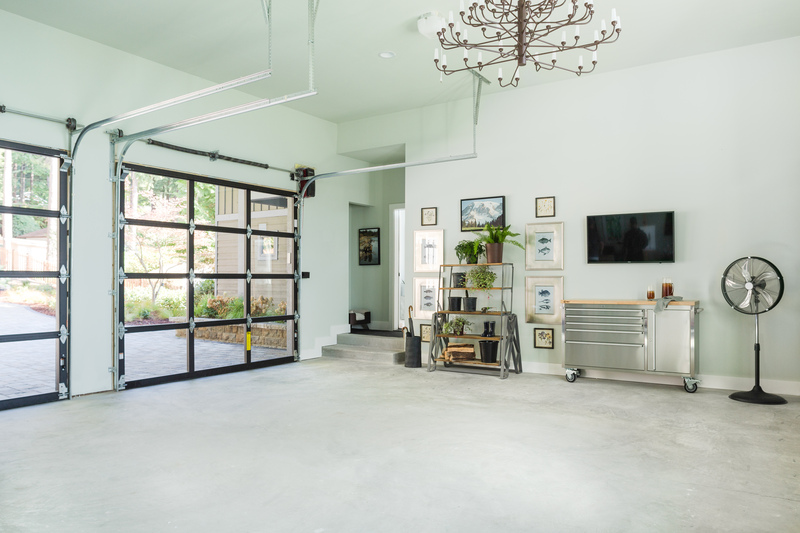 The garage is beautiful, and a seamless extension of the home. In fact, we were served brunch in the space, and it couldn’t have been more lovely. 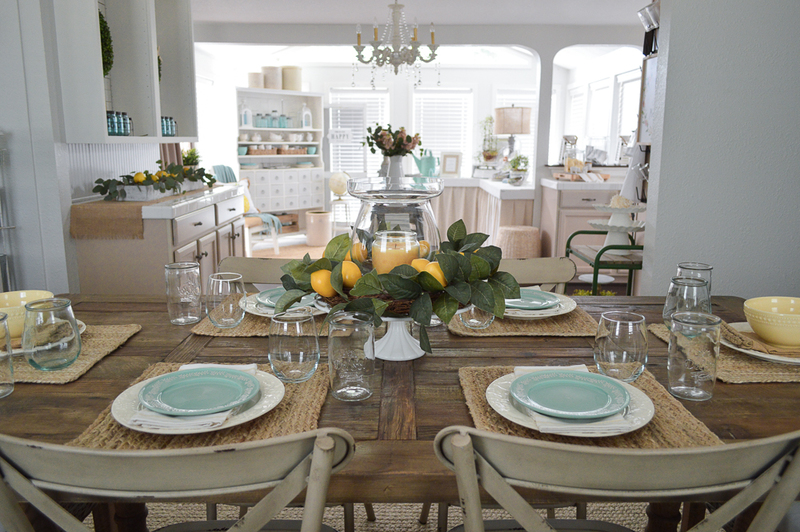 How smart to make this space a bit extra special and be able to utilize it when entertaining big crowds! Something to think about if space is tight. 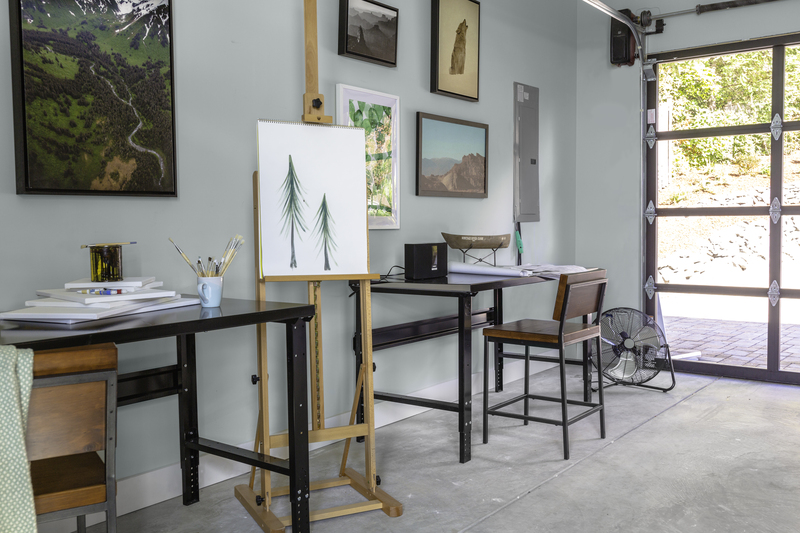 The other side of the room has been set up as a studio, making use of all the natural light the glass garage doors let in. I could also see a dance studio, a ballet bar, so many options! Depending on your life style and needs of course, but really a wonderful idea! 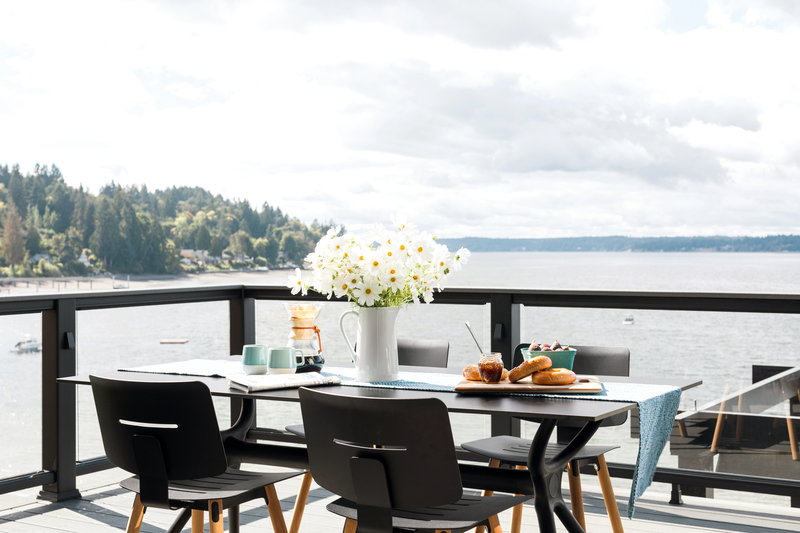 If we step back inside, you’ll be drawn to the panoramic views… but stop at the dining area first. 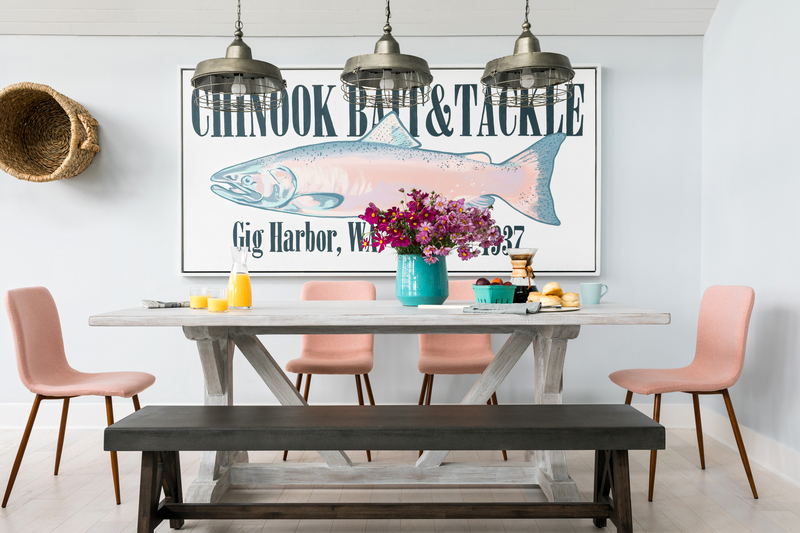 The large scale art, commissioned by Celery Jones, depicts a Salmon and is such a wonderful nod to the PNW. Salmon are are an integral part of life in the Pacific Northwest for many. 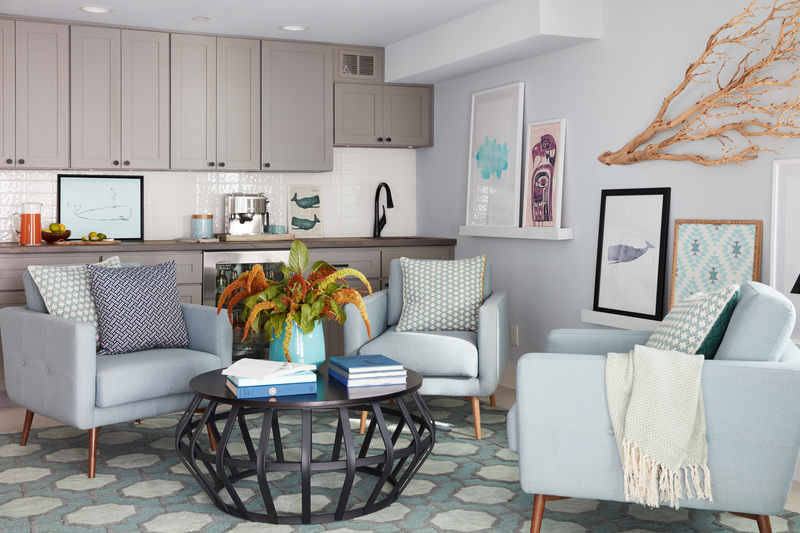 The bold graphics and large scale of the art create it’s own little micro-room, grounding the dining area, even as it floats and joins the other furnishings and spaces in the open concept great room. 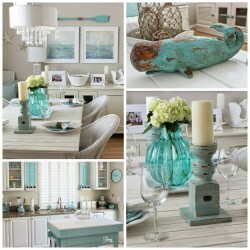 The masterful use of color plays so well with the entire floors color palette. The main floor living room is study in symmetry, and letting the view be the rooms focal point. 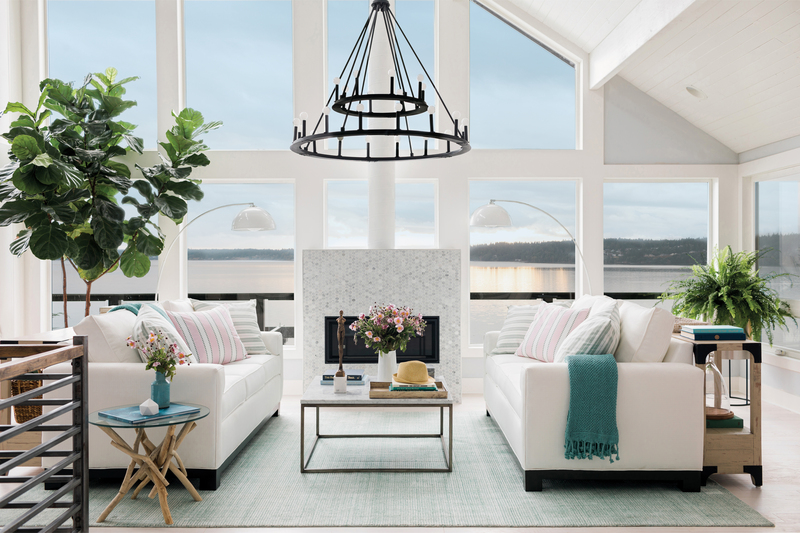 There are twin light fixtures, sofas, and sofa tables. 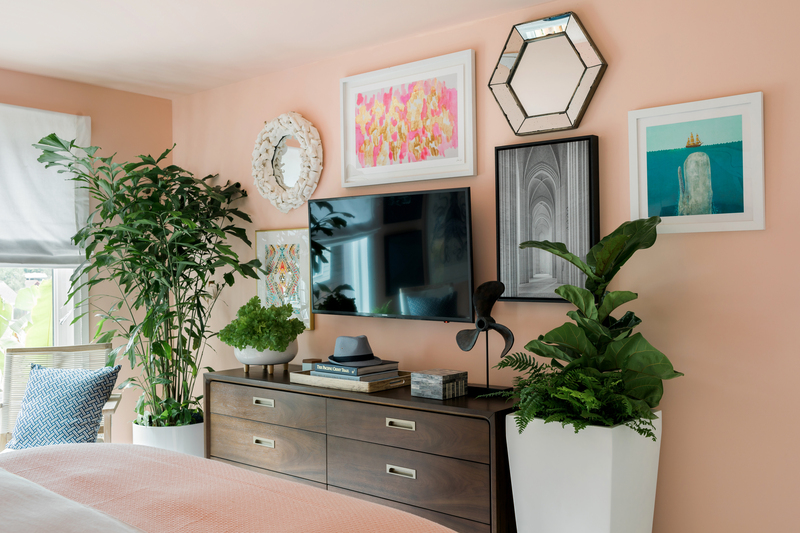 The color scheme has just the perfect bit of feminine warmth with the soft blushes, reminiscent of a sunset, to keep the room looking lively, even on the cloudiest, wettest, PNW days. The newly centered fireplace (I’ll share a before later) is subtle, and the design flawless. Covered in marble hex tiles, it almost shimmers, just like the waters of The Sound. 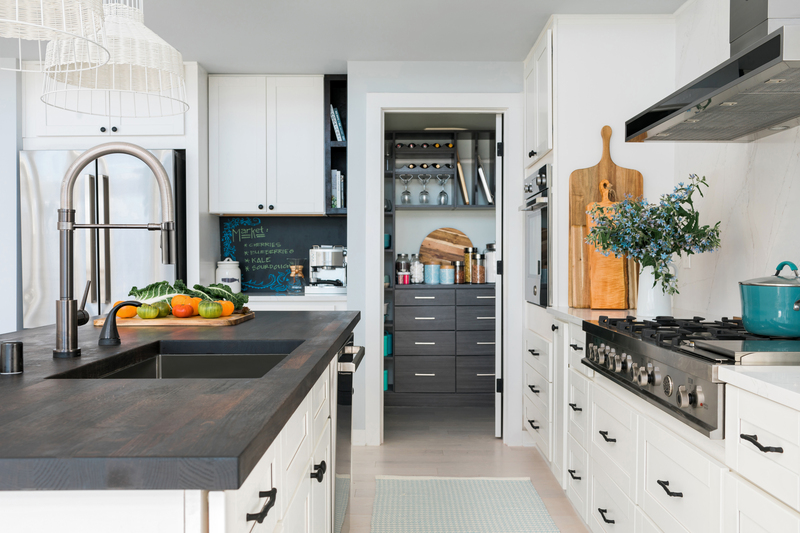 Besides the location and the vaulted ceiling, my favorite feature of the kitchen was the Black Walnut wood island. 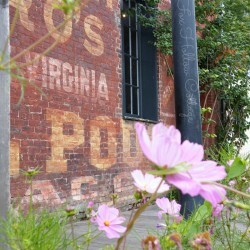 It was warm and lovely and grounded the space beautifully, adding a healthy does of warmth and character! The staircase is genius. 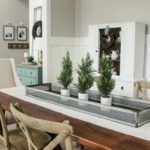 It’s metals mimic the outdoors on a stormy day, as well as the finish of the kitchens appliances. And the addition of the wood railing along the top felt soft, and gave a wonderful juxtaposition to the linear metal. Looking hand scraped, aged, and possibly reclaimed. I didn’t get that particular detail. 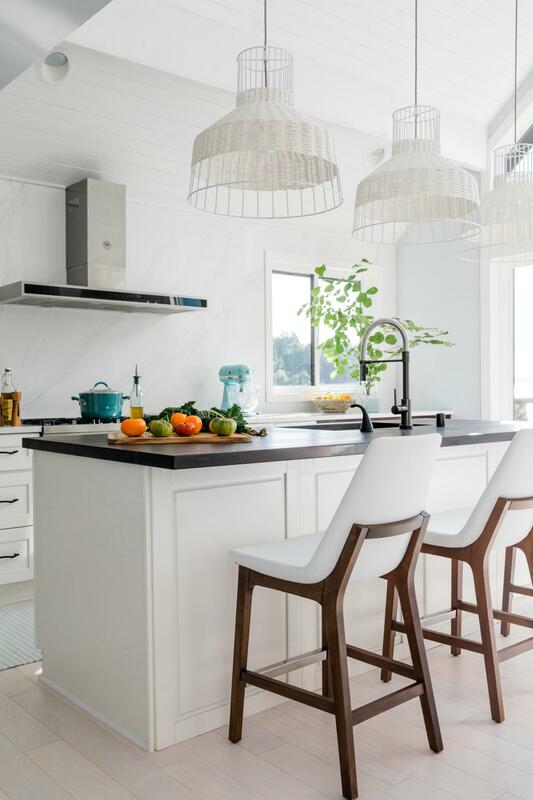 But you can see it’s similar to wood legs on the counter height bar stools. 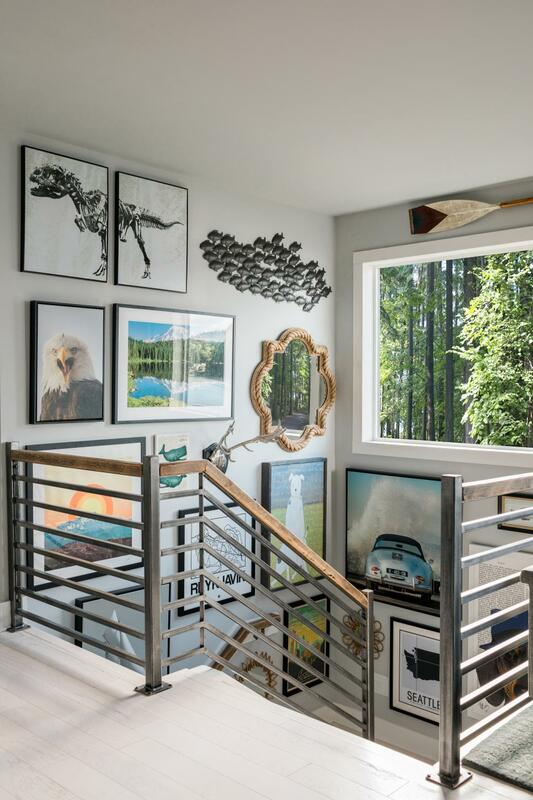 If you look closely, you can just see the doors to the upper deck over to the right… which take you outside to this, and gorgeous views of the water. 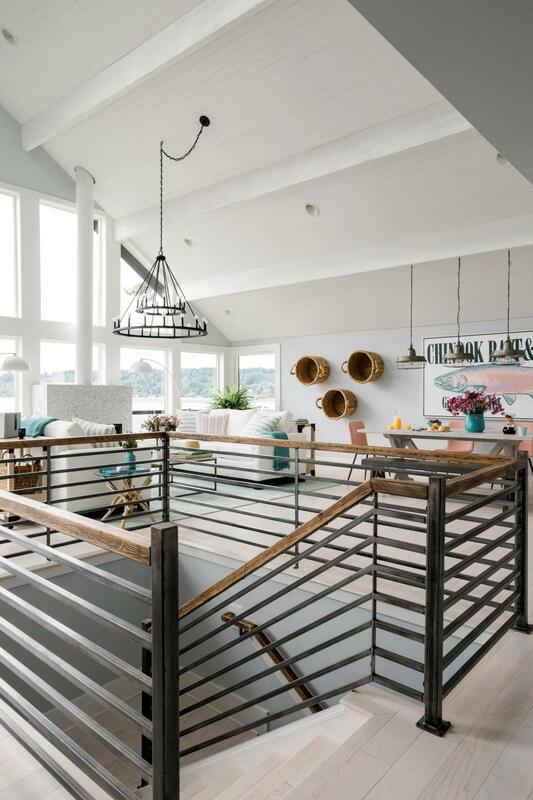 Unencumbered with the railing system that was selected. Here is a better look at that island, and the walk in pantry, which makes it possible to do without those upper cabinets in the kitchen, letting that feature wall command attention. There is a darling coffee nook, with a chalkboard wall. When we visited, there was a chalk art scene of Mount Rainier (pronounced ray-near) But Rainy’er is pretty accurate. Now, we’ll go down the hall and check out the main floor bedroom. 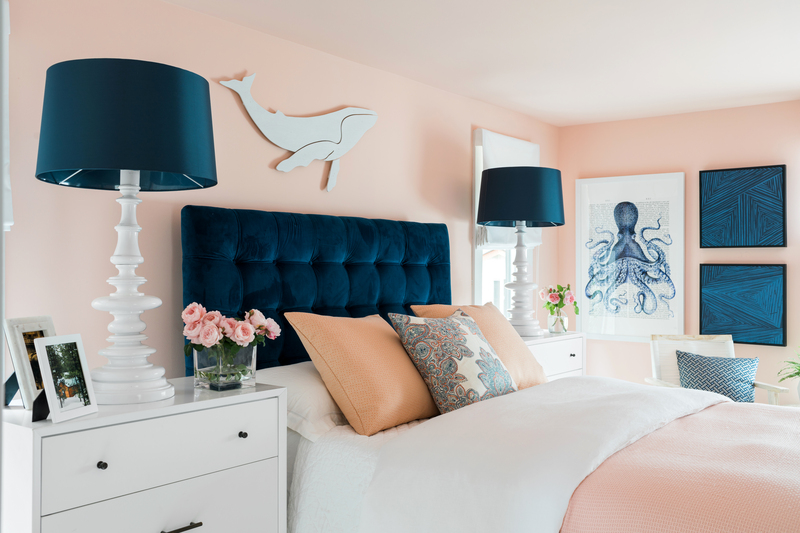 It’s the prettiest shade of corally blush pink, paired with navy. These photos make it appear more peach, but it was sublime in person. So gorgeous! 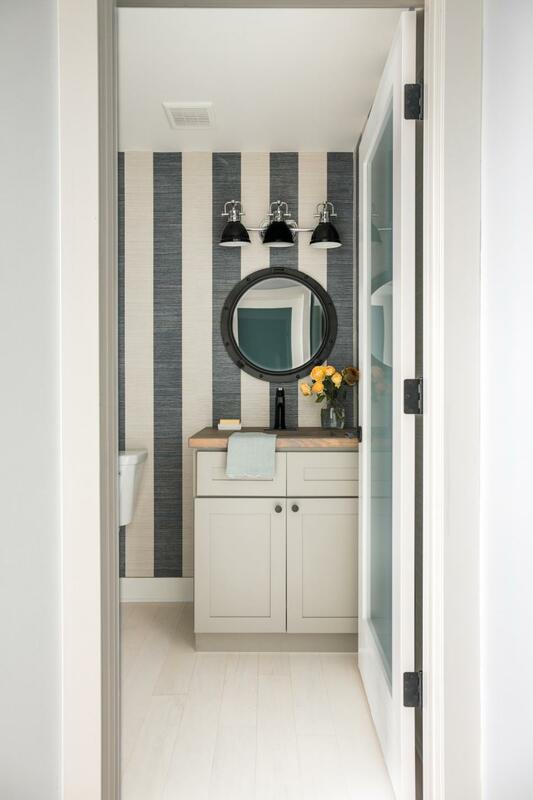 Heading back down the hall, we’ll pass a powder bath to the right, and a barn door that hides the gallery wall clad staircase to the private mater suite! The master bedroom gallery wall. This house convinced me I don’t have enough stuff on my walls! The master boasts it’s very own cozy private sitting area. With it’s own views waiting to be captured. 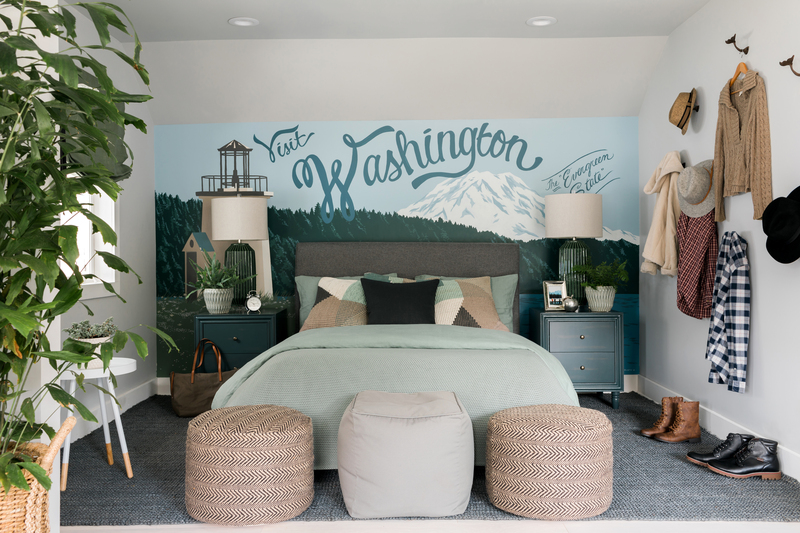 Celery Jones strikes again, this time with a wall mural reminiscent of a vintage postcard. And that set of double, French-swing windows to the left? 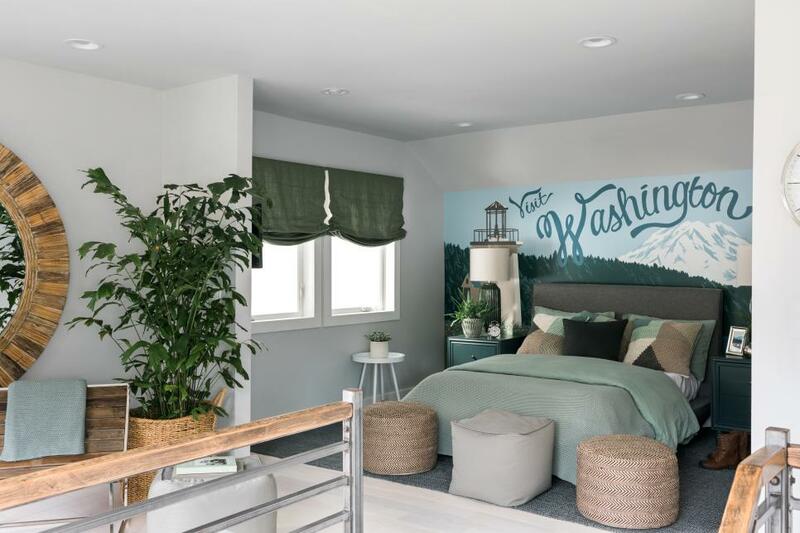 Well that is another brilliant design element, because although the bedroom isn’t on an exterior wall, the window placement allows you to look out over the loft… and right thru to the water! 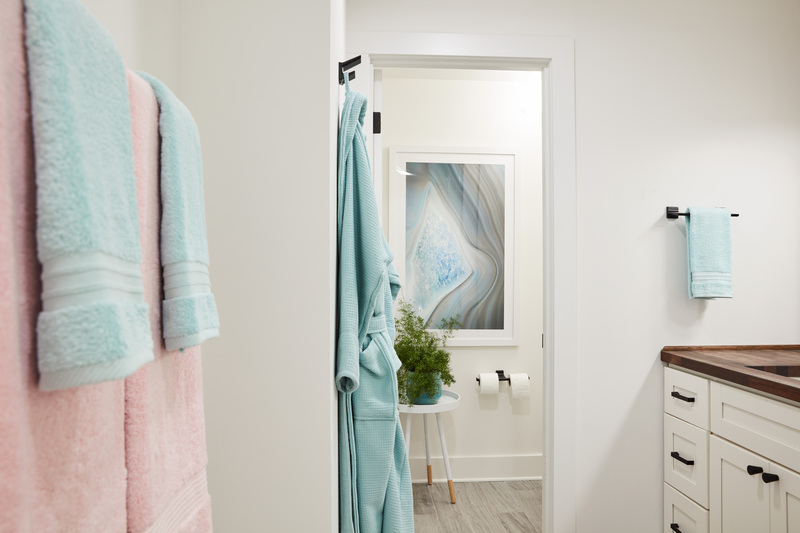 If you turn right at the top of the stairs, the master also holds a walk-in closet and a beautiful bath, complete with a decadent soaker tub! 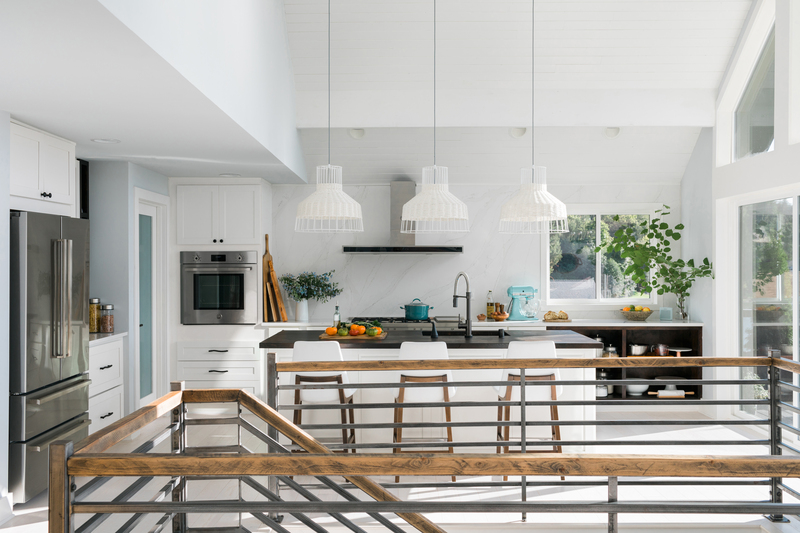 So much of the home had amazing natural light which is imperative to harness. Even on an overcast day, the home glowed! 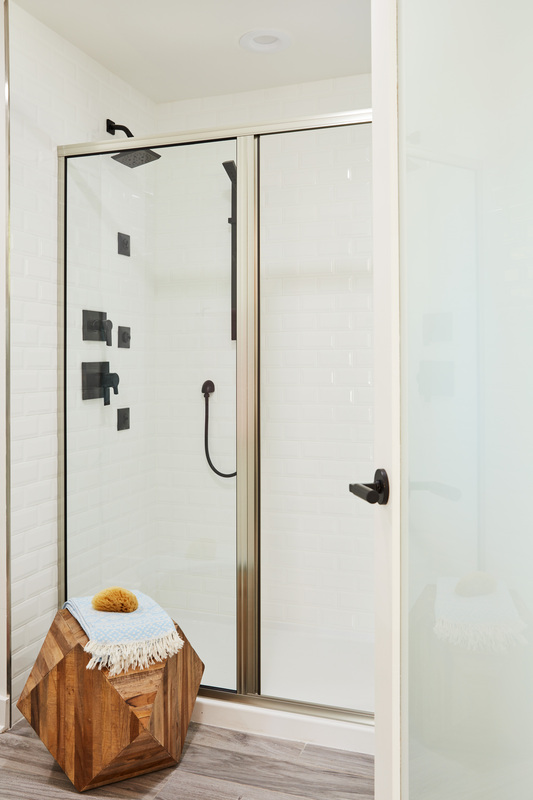 This bathroom had a woven, raised tile on the vanity wall, and it was very dramatic paired with the black and white color story. The “pier pilings” looked pretty cool in person and really played up the coastal location of the home. 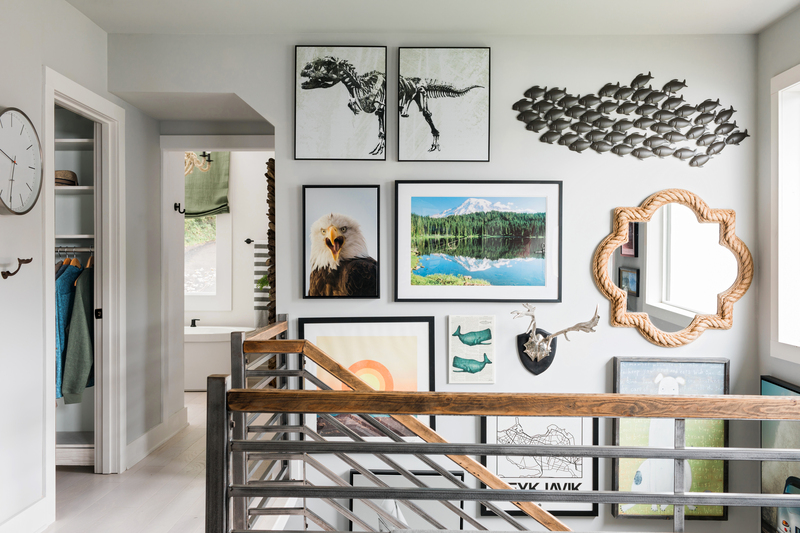 The lower level holds the last two of the 4 bedrooms, and the final full bathroom, along with an abundance of gathering, family and entertaining space. 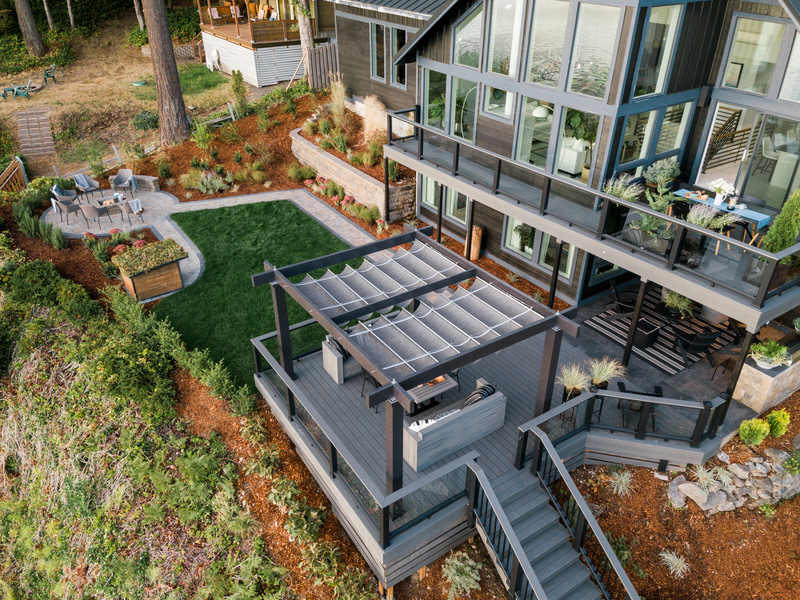 Complete with access to the outdoors, and a staircase that takes you down to the water edge. 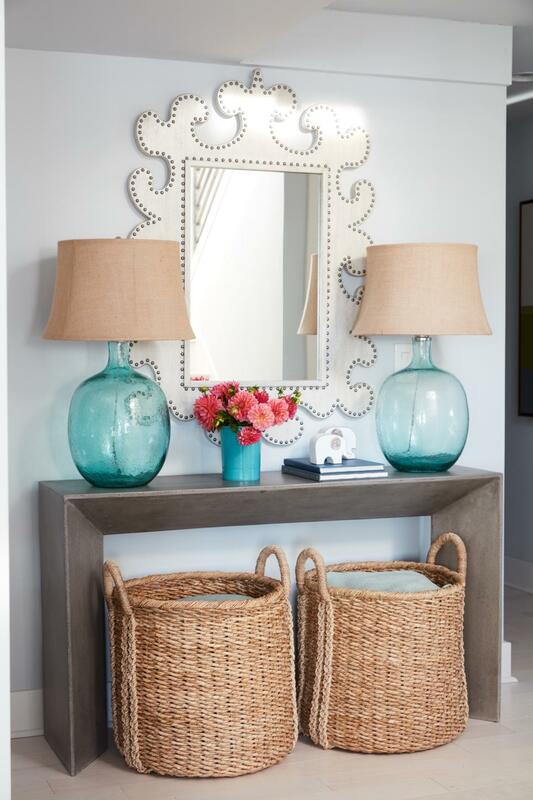 When you enter the lower level you are greeted by a console table, an ornate mirror, and doubly cute glass lamps. Plus a chair to the left that is just out of view. 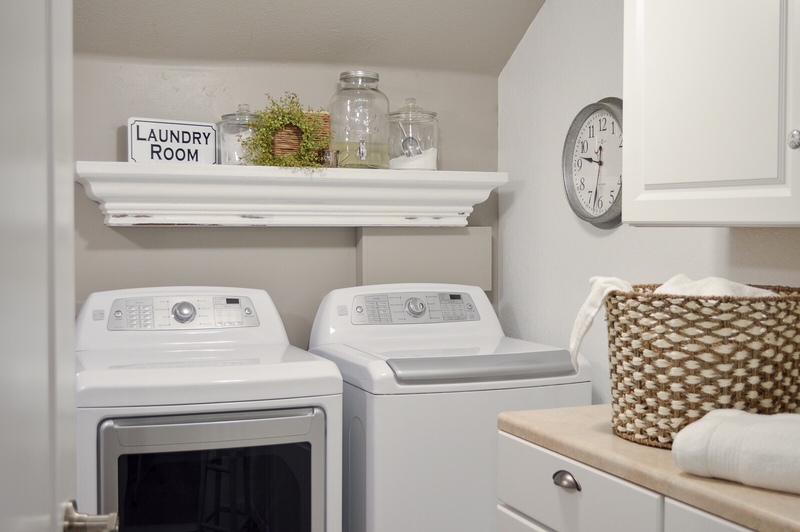 The baskets offer beautiful warmth, texture and handy extra storage. If you continue off the stairs to the front of the house (the side we entered from) you’ll find two bedrooms and a shared full bathroom. 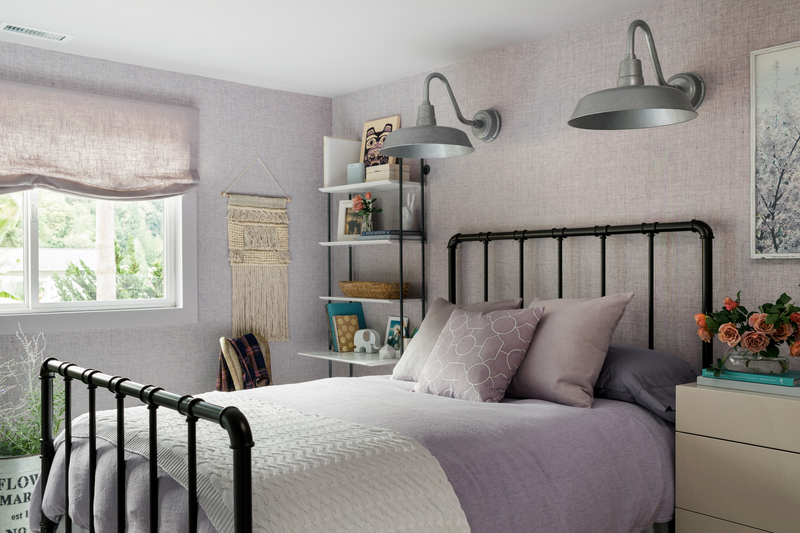 This soft, lavender bedroom’s walls are covered in grass cloth wallpaper for a lovely textural finish. 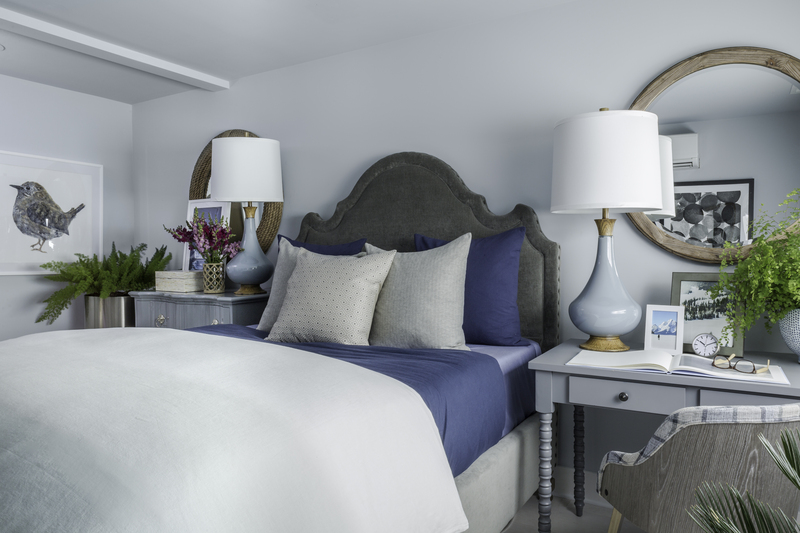 The blue & gray guest bedroom had the dual-duty side tables we loved in the video tour. A desk on one side, and a dresser on the other. 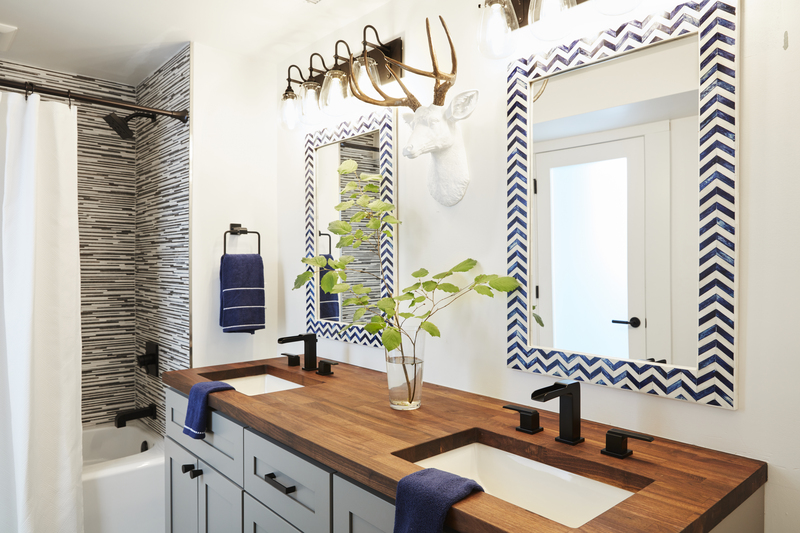 The bathroom on this level had an exciting use of tile in the bath/shower combo, and the double vanity had that wood counter top we all loved! This is the bathroom with the feather art in the commode area. If you were to exit the stairs and switch back, turning towards the water facing side of the house you would be in what is referred to as the den. 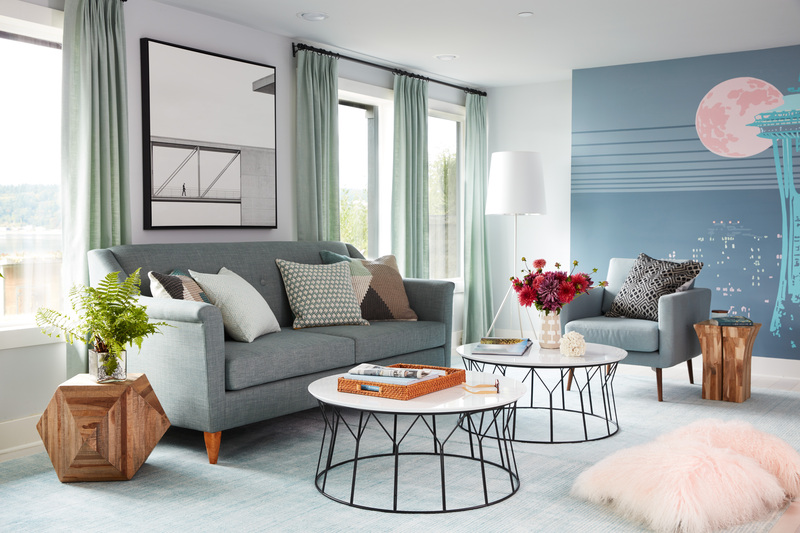 When I turned the corner and entered this part of the home, I was amazed at the way the furnishings were arranged to create several different areas for relaxing, TV viewing, family time, view gazing, exercising, entertaining… it was a most impressive use of space planning. Can your aqua loving hearts even stand it!? 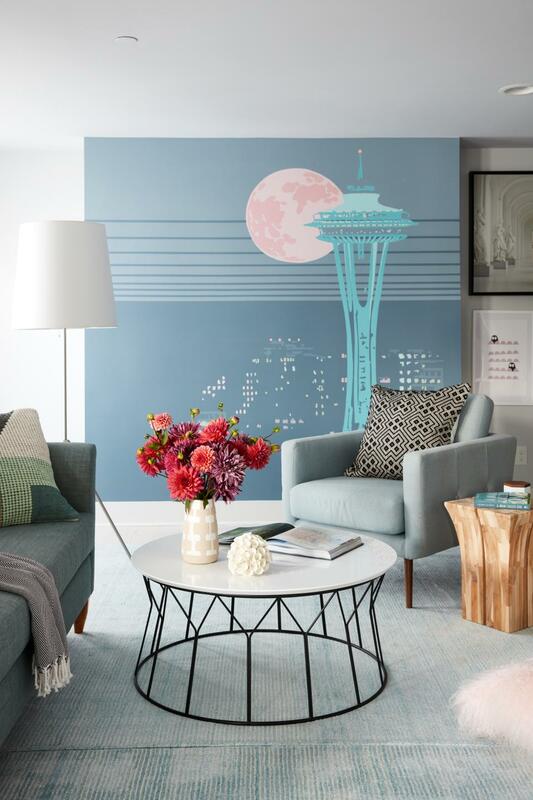 The space flowed from the double facing sofas to the conversation area with the custom Seattle Space Needle art, again, by Celery Jones! This is a show stopper. It’s fun and whimsical in the soft pinks & blues. Everyone loved it. 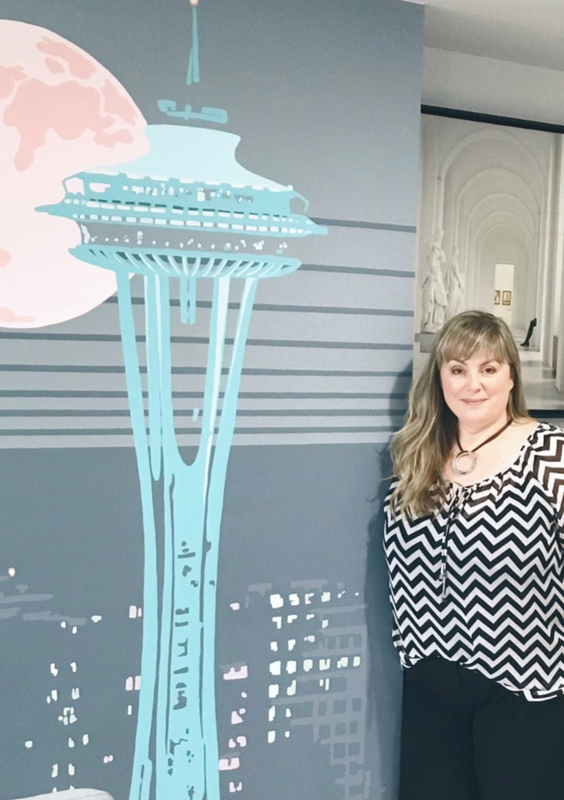 Many selfies and photos were taken in front of this unique interpretation of the iconic Seattle, Washington attraction. The other side of the staircase holds an additional family-style room, complete with a wet bar, wine fridge, mini fridge, coffee maker and a wall of cabinet storage making it perfect for hosting out of town family, friends and overnight guests too! You’ll need it if you win, because you will have a lot of people wanting to come stay with you. Guaranteed. 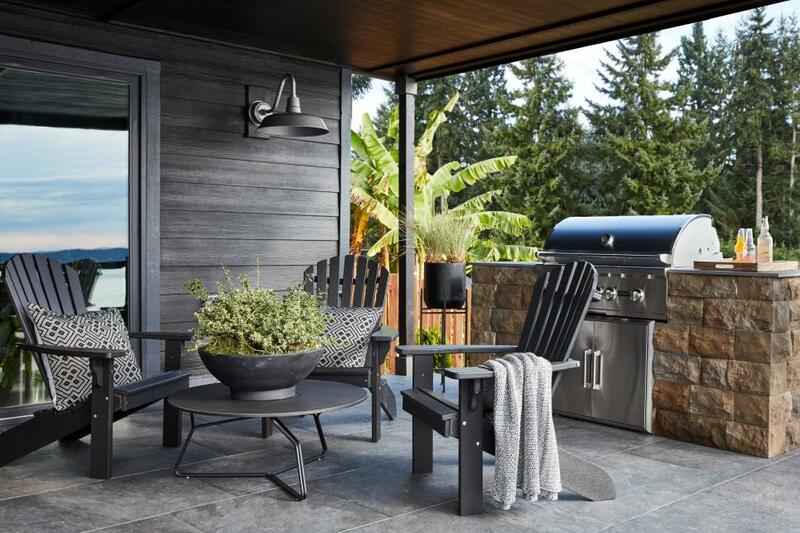 In addition to the patio area off the kitchen, there is also a covered grilling area off the den, and it’s perfect for year-round use, sipping cocktails and enjoying the Pacific Northwest life! 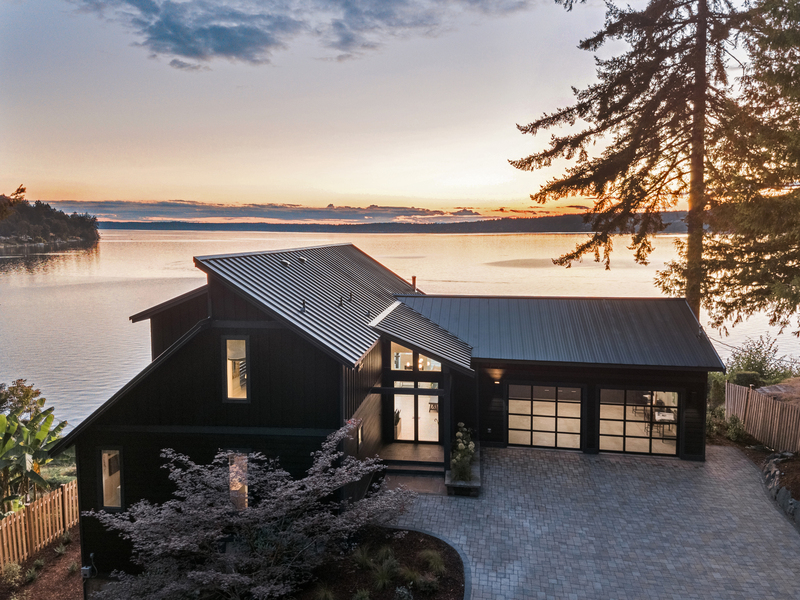 This house was expertly designed to take in the majestic scenery! 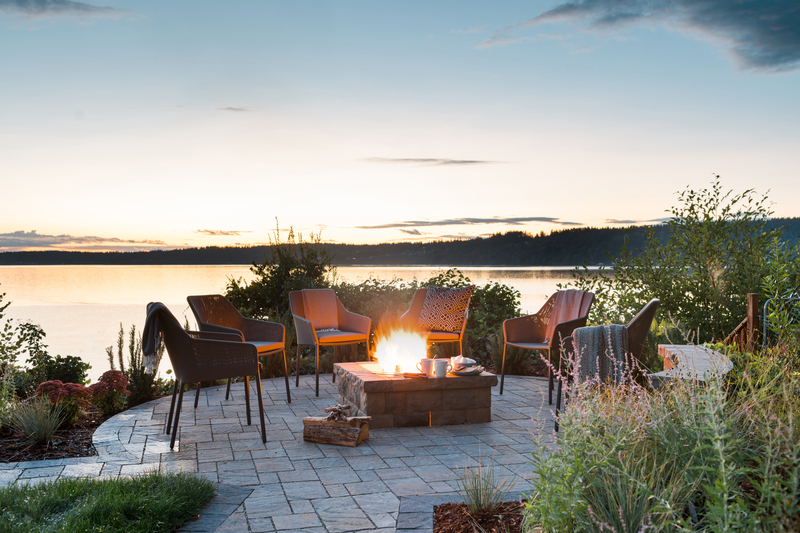 For clear weather and taking in the views, try the real wood burning fire pit. 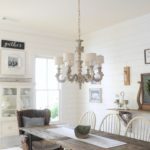 I hope you enjoyed getting to fall in love with this house, just like I did!! If you want specific item sources I’ll try my very best to get them for you! Just leave a comment. I’m not a fan of having my picture taken… and this is post wind blown and rained on, but I did got one photo of me in the home to prove that I really was there. Because pinch me!! This doesn’t even feel like my life. I still marvel and wonder how I get invited to these things. But I am so glad I do, and that I get the privilege of sharing them with you!! My most sincere thanks to Chesney, Joan, Jodie, Mallory & Michael for their wonderful hospitality & the invitation to attend this once in a lifetime event! There will never be another HGTV Dream Home 2018. 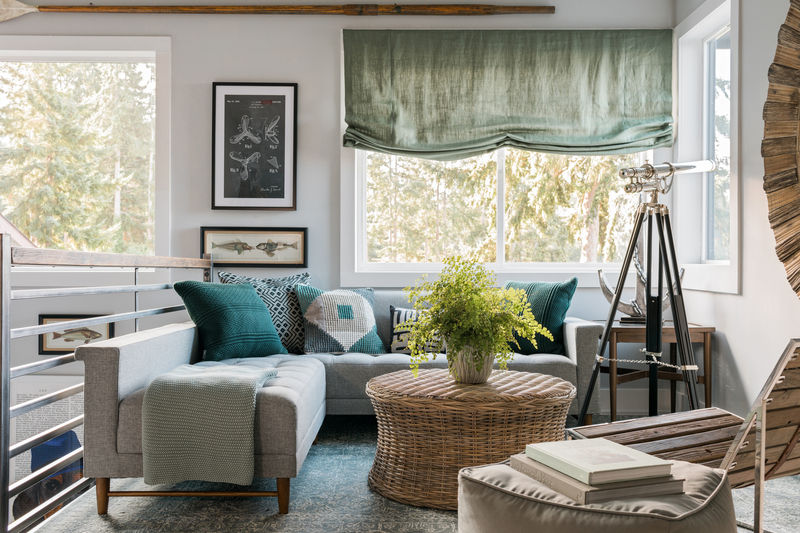 And to the homes interior designer, Brian Patrick Flynn, who was incredibly attentive to each and every one of us, taking his time to answer questions, be interviewed and to be the star of numerous Facebook and Instagram live videos! He was so friendly and made everyone feel welcome and instantly at ease. No purchase necessary. Open to legal residents of the U.S., age 21 or older. Void where prohibited. Sweepstakes starts at 9 a.m. ET on 12/27/17 and ends at 5 p.m. ET on 2/16/18. Odds of winning depend on number of entries received. 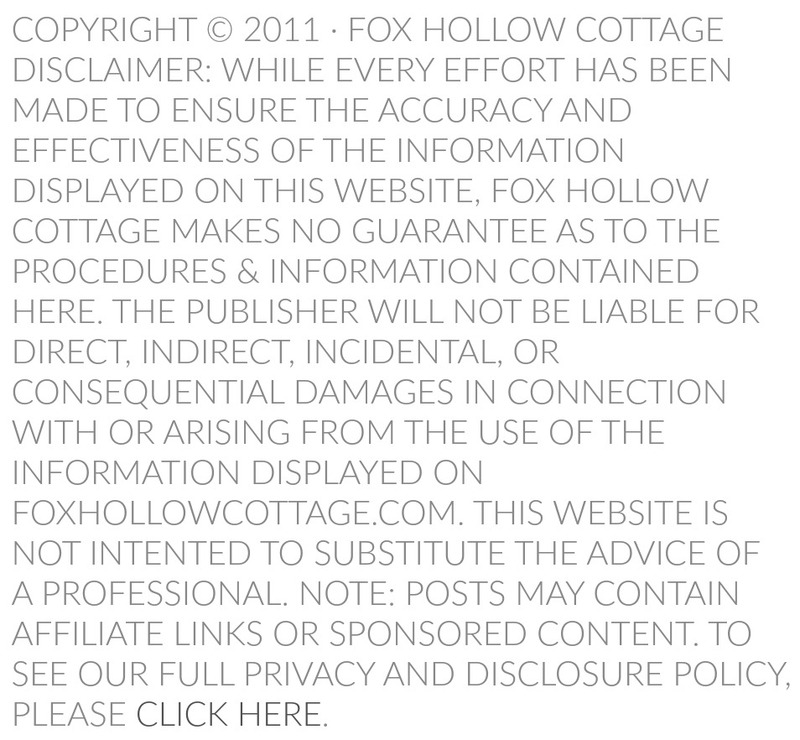 For full official rules, visit HGTV.com/HGTVDreamHome or send a self-addressed stamped envelope to: “HGTV Dream Home Giveaway”- RR, P.O. Box 53013, Knoxville, TN 37950. Main Sponsor: Scripps Networks, LLC d/b/a Home & Garden Television. Such a beautiful location but the house is not my cup of tea – kind of get the feeling I am in a playhouse – no warmth or softness. However, I’m from Canada so can’t enter the contest anyway. Whoever wins this though is lucky to have a Washington getaway. So good luck !! Yes, the winner will be very lucky indeed. You did a great job with the tour. 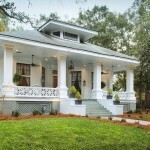 I am not crazy about this style house….and the area. Congratulations to you for a good job.. This is such an amazing property, and what a dream to tour it! 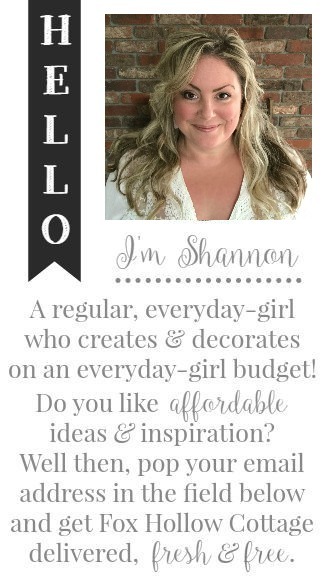 Thanks for sharing the whole experience with us, Shannon! I thought so too Laura. And feel so fortunate that I was able to tour it in person. Can’t wait to see who wins it!! This is absolutely stunning. I love the state of Washington. It’s beautiful and the people are always nice. Everything about this house is amazing. The art work is fabulous. It is! And this location is gorgeous, as was the home. I’m so glad you enjoyed peeking!! Are you ready? 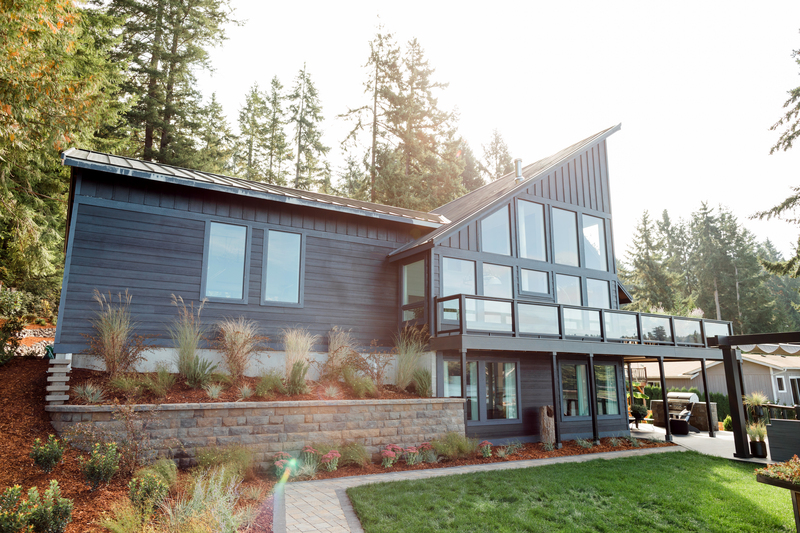 I hope so, because we are going to tour and chat and talk all about the amazing HGTV® Dream Home 2018 in Gig Harbor! 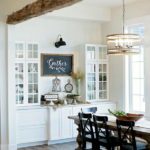 I'm so excited to share this beautifully decorated and renovated home (that you can enter for a chance to WIN!) 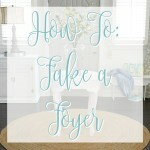 plus details like decorating sources with you!